I respect the way that Pollhammer depicts the goddess as she is in nature, herself, not just personified as a gorgeous naked woman as so many goddesses are. Most modern artists miss her essence just to make a pretty picture. Remember though, from the Vedic hymn, that she is elusive. She doesn’t pose for pictures. 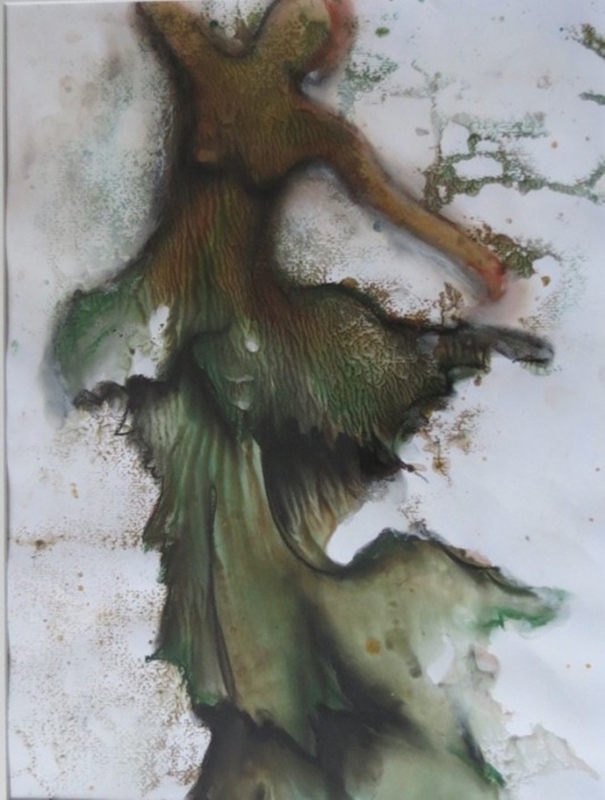 There are not many contemporary forest goddess paintings or digital creations that are more than whimsy. The ones true to the ancient myths are rare, and it has been that way throughout the ages. She is not one to be captured in pictures, neither in the Black Forest nor India. It seems Pollhammer knew this. How did he approach this elusive subject? I shot most of these pix in 2009, a banner year for mushrooms. The two with the blue coffee cup (does it have to be coffee?) are chaga mushroom harvested from one of our birch trees this summer. Click the first picture to open the gallery and see the larger views. There are 49 pictures. There is no solitude in a forest. When in doubt, have a campfire. The Balsamean lives at Balsamea, a small, private forest refuge named for its most abundant tree, the balsam fir (Abies balsamea); in the Adirondack Mountains. Enter your email address to follow this blog and receive notifications of new posts by email daily or weekly. Content of this web site, TheBalsamean.com (thebalsamean.wordpress.com), in all forms and delivered or conveyed by any method is Copyright © 2012 - 2019 by The Balsamean™. All rights reserved. "The Balsamean™" and "Scribblements from Balsamea™" are proprietary trademarks.. For questions, see the Contact page to send me email. I SUPPORT THE NATURAL RESOURCES DEFENSE COUNCIL Mitch Bernard, NRDC’s Chief Counsel, speaks out about how litigation is the best way to beat back the Trump administration’s efforts to dismantle environmental safeguards. Please visit NRDC.ORG and you’ll see why I support them. NRDC is a not-for-profit law firm whose clients are Nature and environmental safety. Their work is based on responsible scientific research. They are not just lobbyists or activists. They fight for us in court, with a record of legal victories vital to good environmental policy, regulation and legislation. They work on local, national and international cases. See many more NRDC videos. Donations to NRDC are used to fight the Trump administration’s anti-environment attacks and for other campaigns to protect the environment. American Forests is creating healthy and resilient forests from cities to wilderness that deliver essential benefits for climate, people, water and wildlife. – increasing understanding of the importance of forests. Since 1976, American Hiking Society has worked with Congress, federal agencies, and many recreation and conservation partners on policy issues and legislation to ensure funding for trails, preservation of natural areas, and protection of the hiking experience. As the national voice for hikers, American Hiking Society recognizes that foot trails and hiking are essential to connect people with nature, conserve open space, provide biological corridors for diverse plants and wildlife, and for the health of Americans and our natural environment. The post Take-Action Trail Funding appeared first on American Hiking Society.